David Taska is a current PY2 (Class of 2021) attending Asheville Campus, from Phoenix, AZ. After going through several career changes from wanting to become a dinosaur, marine biologist, to physician, David found his calling in pharmacy, specifically clinical toxicology. He completed his undergraduate degree in Physiology from University of Arizona. He also completed his Master’s degree in Physiological Sciences at UA. 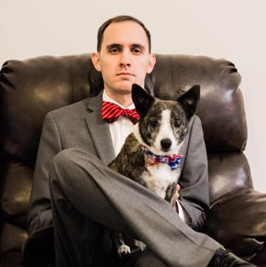 For today’s student feature, Sit with Senate’s Jisun Ban sat down with David and his dog Winston to discuss his experience at the UNC Eshelman School of Pharmacy. Sit with Senate: How has your perspective on the profession of pharmacy changed since joining the UNC Eshelman School of Pharmacy community? David Taska: In my first semester and half, I have grown to realize just how pivotal a pharmacist is to the healthcare team, and to the patient specifically. I have fully comprehended what it means to be the “experts on drugs.” Because of our expert knowledge, I have grown to realize how important pharmacists are, and that we are depended on by physicians and the healthcare team. This has led to many pharmacists pushing for provider status, because as I have grown to learn throughout my short time here, physicians cannot handle the burden of healthcare alone. DT: I think it was from Dean Mollie Scott at the Asheville specific orientation. She told us that there will be many ups and downs along this path that we call pharmacy school. She emphasized the importance that we all be there for one another, no matter what. Her words really resonated with me because there have been many times both semesters that I personally have had my challenges, and my fellow Chapel Hill and Asheville colleagues have had challenges. We as Class of 2021 have really embraced the term “Pharmily” because this journey isn’t easy, and it’s not supposed to be. But we all have the ability to make it out 3.5 years from now. DT: I would say Dr. Persky. His teaching style is clearly well researched and in combination with his background on how students learn, he knows how to teach effectively. Add on the fact that he is funny with his occasional puns, and keeps me engaged, I would have to go with him. D-Wills [Editors Note: “D-Wills” is a nickname for award-winning professor Dr. Dennis Williams] is my second simply because it’s D-Wills. DT: I have learned how to prioritize my time on a day-by-day basis rather than a week-by-week basis. In undergrad and even my Master’s, I did not have the sheer amount of assignments that I am presented with each day in pharmacy school on top of studying. Because of this, each day presents its own little battle that I have to navigate and prioritize what I want to focus on with the remainder of the day after school is over. Furthermore, because of the amount of assignments, I have learned how to get up earlier to work on stuff and stay up later to finish assignments. Currently, I am the Asheville Liaison, Asheville representative student interviewer for the next Dean and teaching assistant for PHCY 502 and 503. I am also involved in Health and Wellness committee and Steering Committee for re-accreditation. SwS: In your opinion, what is a trait of a strong leader? DT: I think a strong leader needs to have good listening skills. A good leader needs to listen to those around his or herself, before communicating the messages of his or her colleagues. While there are numerous traits that go into making a good leader, if one cannot listen effectively, then one cannot communicate effectively. And if a leader cannot communicate, then he or she cannot lead. SwS: What inspired you to join certain student organizations on campus? DT: I am a member of Asheville CAPS and KE. I wanted to join more, but I did not want to stretch myself too thin. I really enjoy what each organization does for me in terms of community outreach, learning pharmacy-related skills such as BP monitoring, and leadership opportunities. For KE specifically, I was never in a fraternity in undergrad, so I wanted to be a part of a brotherhood that would create lifelong memories, and something I could share with my colleagues in Chapel Hill, and my fellow Asheville colleagues. DT: Originally, I wanted to be a dinosaur. However, when I learned how much willpower it would take to become one, I had to switch paths. For most of grade school I wanted to be a marine biologist because I love animals and the ocean. Then when I decided that healthcare was the field for me, I explored becoming a physician, until I learned that pharmacy and specifically clinical toxicology was my calling. SwS: What is your pet’s name? and how long have you had your pet(s)? 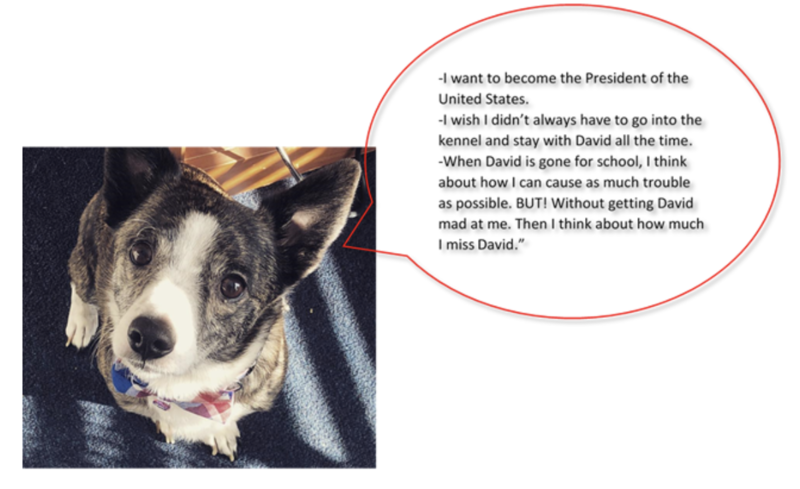 DT: My pet’s name is Winston and I have had him for 2.5 years. It will be 3 years come May. DT: I say two things generally: First, “why do I get the last 1/5 of the bed, when you get the final 4/5ths?”; Second “Winston you’re letting the warmth escape the covers and now I’m getting cold.